For those who don’t know how our electricity grid work, this post is just a starting point, introducing how the mix of generators bid, to satisfy demand projected by AEMO. Price is low when demand is low, satisfied by wind and/or brown coal. Price is high when demand is high. 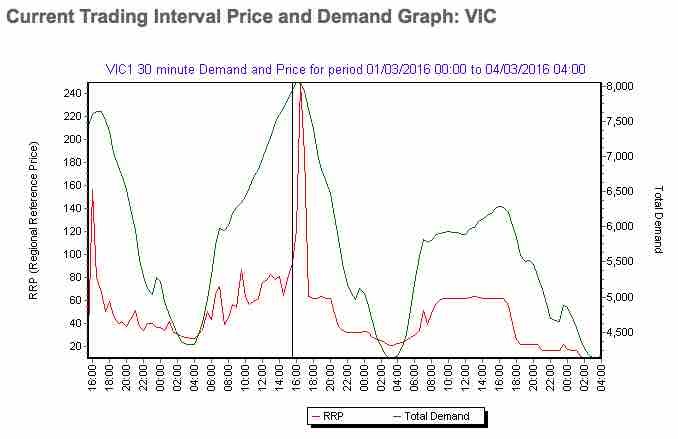 Here the peak is $240 per MWh which corresponds with 24cents/kWh, wholesale, which means your retailer doesn’t make much money at peak time but, obviously, you’re paying a big premium when demand is low. There’s a ceiling price for bids, a cool $13,100/MWh. All generators receive the same price as the last high bid accepted to fulfil demand. This entry was posted in Events local and tagged AEMO, cost electricity. Bookmark the permalink.